“The Easter Mystery” is based on the empty tomb in Luke 24 v 1-8. It is ideal for use in children’s groups, at holiday clubs or giving away at Easter events. Suitable for use with ages 6-12. • Can you crack the 'Easter Mystery'? We gave each Sunday school child one of these for Easter. 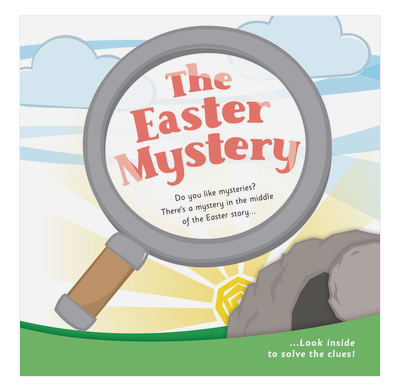 Very good booklets with easy to read account of Easter and puzzles to solve included. Very good value for money and one of very few similar out reaches on the market. This is a good leaflet for children. The idea of a mystery to solve is appealing to boys. Children will love solving the puzzles. A novel way to put across a timeless message.